Sixty patients with cardiomyopathy along with sixty healthy controls were recruited through non-probability purposive sampling. A case of severe reversible dilated cardiomyopathy associated with a large left ventricular thrombus in a young child possibly due to non-specific aortitis who successfully underwent stent angioplasty with no residual coarctation, with normal upper extremity blood pressures and improved LV size and function was reported by Ponniah et al. Peripartum cardiomyopathy characteristics and outcome in tertiary care hospital. Once a patient has been diagnosed with peripartum cardiomyopathy, recommendations for future pregnancies should be made. Cardiomyopathy is the leading cause of death in patients with DMD. Here we present a case of methamphetamine overdose, which presented with cardiomyopathy and severe systolic heart failure whose cardiac function was normalized after treatment. 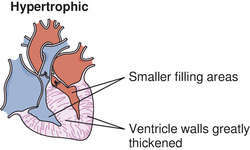 Hypertrophic cardiomyopathy (HCM) is a common genetic disease that is characterized by a hypertrophied, nondilated, left ventricular (LV) cavity with normal or supernormal systolic function. Arrhythmogenic cardiomyopathy has gone by many names over time.